Let Purely Skin guide you to your best facial waxing experience. 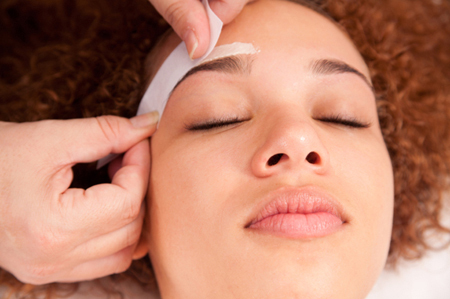 We consider each face waxing to be a mini skin treatment. You receive personal attention to your skin type and wax is chosen accordingly for optimal hair removal and minimal irritation whether it is face waxing, brow waxing, lip waxing or chin waxing. After hair removal, your skin will be treated with a soothing serum or mask and protected with sunscreen before you leave. Application of mineral powder is safe and provides coverage to hide any redness. Brow Waxing, Lip Waxing, Chin Waxing and More…. Brow waxing has become an art designed to create the best frame for your eyes. You are unique. Your face provides the answer to the best shape for your brows. Allow us to create the best frame for your eyes. Many clients find that after brow waxing, they need less make up to create definition for their eyes. It can be a great option for tweens and teens to transition into a more sophisticated look without adding makeup to their regimen. Lip waxing, chin waxing or full facial waxing create a clean and defined look. All types and color of hair are removed quickly and efficiently. Many clients enjoy the smooth and flawless application of makeup in the weeks following their face waxing appointment.